We guarantee Yodora soothing to apply after shaving . . . gives day-long protection . . . won’t harm finest fabrics, or your money back. *If you suffer from skin irritations due to allergies or functional disorders, see your doctor. Even in the 70s, some antiperspirants couldn’t be applied after shaving – they’d cause skin problems I don’t even want to get into here, in case someone’s eating. Looks more like she’s giving herself a breast exam than applying cream deodorant. I’d love to see the “how to shave your underarms” BOOKLET, though. That just might be the only deodorant advertisement ever hung up in a garage with pride. Is this one of those “GEM girlie photos” from the article below? Yodora…sounds like a Japanese email program. 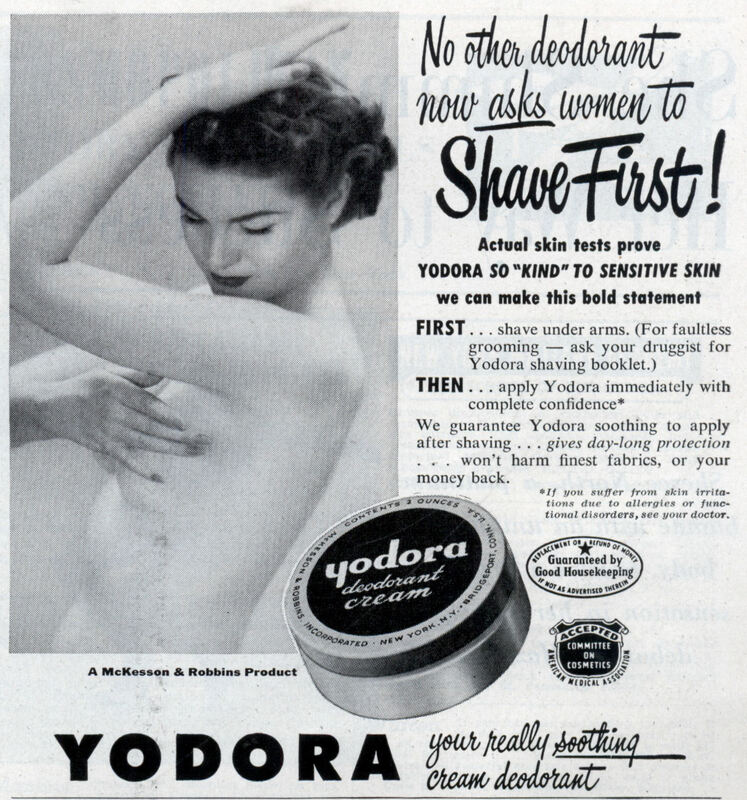 Yodora: First, shave you must. You guys crack me up. This is the wittiest place I visit on the web. Of course I hang out on some pretty lame sites…. Nora knows no idle hour / All day long she craves a shower / “The rush today was something hideous / How’s a nurse to stay fastidious?” / “The dream deodorant you seek / is called Yodora – it’s unique!” / Now roses, pink and other flora / Are no more sweet and fresh than Nora. The cartoons that go along with this ad just make it that much better.